I knew this was a possibility as one of my riding buddies MG was running the Sydney Half Marathon this morning, but my ride route this morning was interrupted by the Sydney Marathon. I took off early as I needed to be back home at a reasonable time. As I got to the city I realised that my desired route would be heavily interrupted. There were road blocks everywhere and the police were manning the on ramps to the Sydney Harbour Bridge and Western Distributor. I asked one of the officers whether I could go through the road closures and he gave me the OK, but he could not guarantee my return route. This gave me the opportunity to set my fastest time up a completely closed Oxford St in Sydney’s Inner East. I planned on putting down a couple of laps in Centennial Park, but it was closed off to cars and cyclists too. So I stuck to the roads and headed to see the morning at Coogee Beach and Maroubra Beach. I have only recently discovered the riding around the roads of Coogee Beach, and they are steep. There are a couple of 16% pinches, short and nasty, but I now have a pretty good base off the back of the Gran Fondo. Still I am not a climber and hauling my body up those inclines gets me easily into the red zone. Th final destination before turning back was La Perouse, and the weather was perfect. There were fishing boats heading out of Botany Bay no doubt to take advantage of the seasonal migration. I headed back and tried to put the hammer down at times, until I hit the runners. While this photo shows some of the marathon runners, the first athlete that I saw was the fastest wheelchair marathon runner. He was motoring! So I didn’t have a chance to whip out my phone to snap a shot. It was at this point near the Sydney Cricket Ground that my route was heavily interrupted, and a pretty good excuse if you ask me. 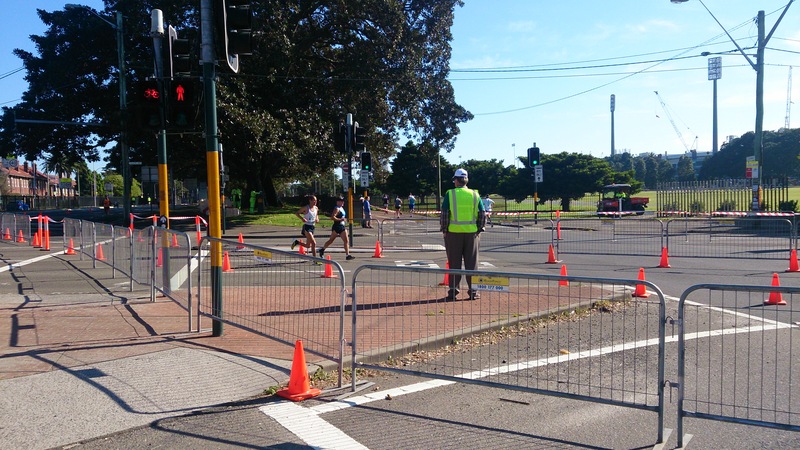 I rode further up ANZAC Parade back to the city and then hit a complete road block. This is where I passed the runners who were doing the shorter 9km run. 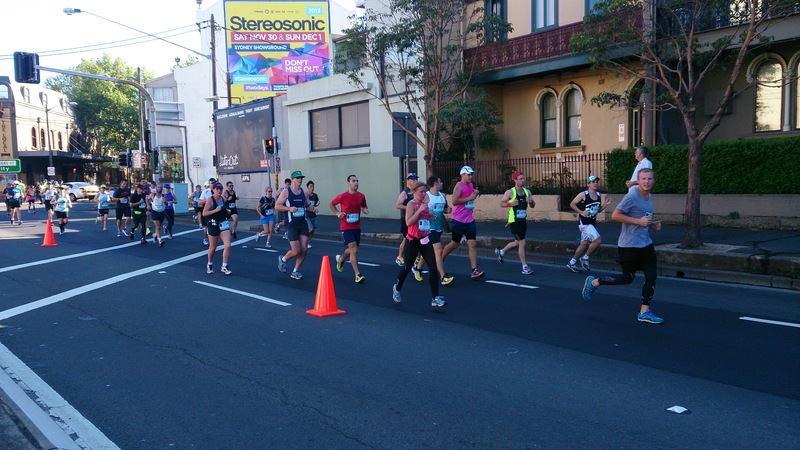 These guys were not the prime marathon athletes but they were giving it a good crack – respect!